While working for Western Electric, I took a night job with the post office to help defray expenses. My job was to pick up the mail with a mail truck. They routed me out on the Nutley run. I use to start about 5 or 6 o'clock at night and go all the way out to Nutley, and start my route there. My run would end at the last mailbox about 9:15 in the evening. They gave so much time and so many boxes to pick up mail from, you had to work it so that if the mailbox said pick-up at 7:15, you'd better not pick up much before that time, because they would keep a close tab on the pick-up times. If pick-up was suppose to be at 7:15 and you got there at 7:10 and picked up and went on to the next box, and someone came along with a special letter and dropped it into the mail box before the scheduled pick-up time, it wouldn't be picked up until the next day. If that letter had a special destination and it didn't get there in time, the sender would complain to the post office department. So you were better off being a few minutes late than being a few minutes early. Sometimes the post office would drop a special letter in the mailbox addressed to the postal service. They would wait and drop it in at the last minute, at the exact time of pick- up. If you had already picked up the mail, and you didn't have that letter when you got back to the post office, you would hear about it the next day. They would tell you that you picked up too early. That's how they used to watch the drivers. Some drivers would pick up the mail early and then loaf somewhere for an hour or so sleeping. A lot of them used to do this. If you didn't dilly-dally you could make your whole run in an hour and not have to take the two or two and one- half hours allotted. But I never had that problem, because I knew about the special mail drop and I made it my business not to schedule my runs to finish too early. But it was a nice job. I had it for a few years. I liked it. Of course, it was in the evening. I would get off work from Western Electric at 3:30 p.m. It would take me about an hour to get home, and at 5:30 I would start work at the post office. Which was nice. It wasn't too hard a job. 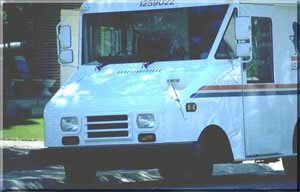 It was easy driving a postal truck and dropping the mail in the bags in the back of the truck. Sometimes I would pick up at the small, local post offices, like the ones we have in Florida. If you picked up registered mail, you would have to sign for it. Then you would make sure that you hid it somewhere in the truck in case somebody knew it was registered mail and would try to steal it from you. When you got back in, the registered mail would be the first thing you got rid of, and you made sure you got a receipt for it. There were so many things to look out for at the postal department. But I liked it. I made quite a few friends there. After the war the postal service started to let go of their extra help, and I was considered extra help--a part-timer. A lot of the boys were coming back and getting their old jobs again. They couldn't afford to keep both of us on. So they let us go, which I didn't mind. It gave me more time at home, and to be with the family.